Three astraunouts, including Indian-American Sunita Williams, have safely returned to Earth from the International Space Station (ISS). Sunita along with two fellow astronauts, viz. Flight Engineers Yuri Malenchenko and Aki Hoshide, landed at 0726 IST on Monday in the town of Arkalyk in central Kazakhstan, after spending four months in space. They touched down safely on the steppes of central Kazakhstan on board a Russian Soyuz capsule. Search-&-recovery crew rushed ion helicopters to assist them because the Russian Soyuz capsule parachuted down around thirty-five kilometers from the planned site because of a procedural delay. There are still three astronauts, viz. Kevin Ford, Flight Engineer Evgeny Tarelkin and Flight Engineer Oleg Novitskiy, on board the ISS and they will return to Earth next year. So far, Williams has spent 322 days in space during her two long-duration space missions. Previously, she served aboard the ISS from 9th of December 2006 to 22ns of June 2007. 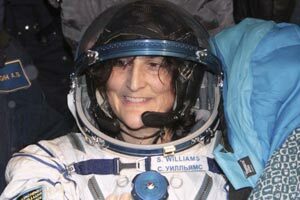 Forty-seven-year-old Williams now also holds the record for spacewalking time for female astronauts. Over a total of seven spacewalks, she has 50 hours and 40 minutes of spacewalking time.